The Spanish Leadership Working Group (SLWG) recently met at the Winpisinger Center to review and update class material and plan for 2017 Spanish Leadership and Spanish Staff classes. Members collaborated and brainstormed about the best methods to support and strengthen the IAM. Discussions on outreach to participants for the Spanish Leadership classes, the student’s subsequent return to their lodges and communities as prepared activists, and the importance of involvement were vital topics. As the political and legislative landscape heats up around issues affecting labor, it is critical for unions to grow by organizing in every region and demographic. One of the fastest growing sectors in the workforce are Spanish-speaking workers. Spanish Leadership classes are a key opportunity to educate these members. Local lodges, districts, stewards and officers are encouraged to identify and enroll Spanish speaking/bilingual members. 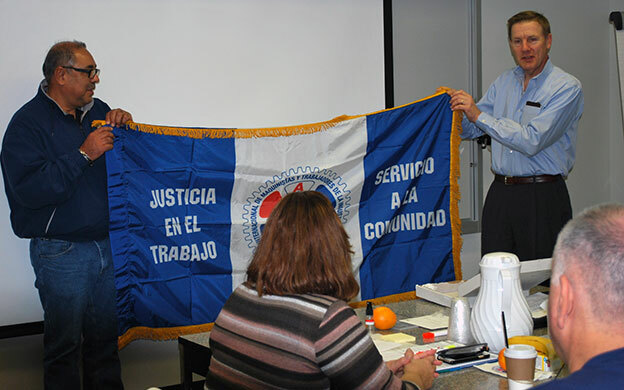 Like the English-language Leadership programs, the Spanish Leadership programs build a solid understanding of trade unionism and provide participants with the skills and tools they need to effectively represent and grow the membership. If you have any questions about the Spanish Leadership Programs or need any additional information, please contact Edmundo Osorio at 301-373-8814 or email: eosorio@iamaw.org. The post Spanish Leadership Working Group Builds Toward Future appeared first on IAMAW.